I plan on changing phone. My lists have been synced but I don’t think my recipes will be transferred. Can you confirm this? Your recipes can be transfered to a new handset using the Backup feature. Even though recipes can not be synced instantly like shopping lists, the full backup will save and restore all your grocery data. So this means only the master phone that does the auto backup to the cloud, should add recipes, if all phones want to share them? Otherwise, a restore to sync recipes on a non-master phone would overwrite any local recipe entries? Perhaps a useful suggestion would be to add the ability to add and maintain recipes via the web UI. In fact that would save a lot time since recipes can be complicated, and usually they have been found on the internet anyway so one could just cut and paste. Dorothy, yes, all recipes should be added on the master phone and all recipes will be overwritten on secondary handsets. Sorry for the inconvenience. We are working on making it easier to modify recipes. Thanks for your feedback! 1. Decide which account you’d like to use in the future and delete another account from cloud. On your secondary handset, go to Menu –> Settings –> Accounts –> long-tap account –> Delete –> Delete from cloud. 2. Make sure that primary device has only one account record under Accounts tab (this is going to be your account) and secondary handset has no accounts listed under Accounts tab. 3. On secondary handset: under Accounts tab –> tap Plus button –> Log in to account –> enter Account ID and owner password –> Login. 4. Restore backup and Pull lists from cloud. 5. Now your devices should be in sync. I’m having trouble creating additional new synced shopping lists. I push one to the cloud and all seems okay. But I push another list to the cloud and the first one disappears. It seems like there’s a limit of 10 shopping lists. At least, no matter what I do I can’t establish more than 10 lists and it’s always the last ten that show up in the cloud as available to be pulled down. Is it the case that there’s a limit of 10 lists or is there some other sort of problem? Thanks for your question. Kindly note that there is no limit of the number of lists that can be pushed to cloud. Are you keeping all the list in the app after you push them to cloud? Thanks, Alex. Yes, the lists are being kept in the app and appear on the All Lists page. If I edit one of them, it correctly indicates that it’s being synced. The Accounts page reports that 14 of 14 lists are synced, just as it should. But after I push all the lists to the cloud only 10 of them can be pulled down, even on the same handset on which they were created and continue to reside. 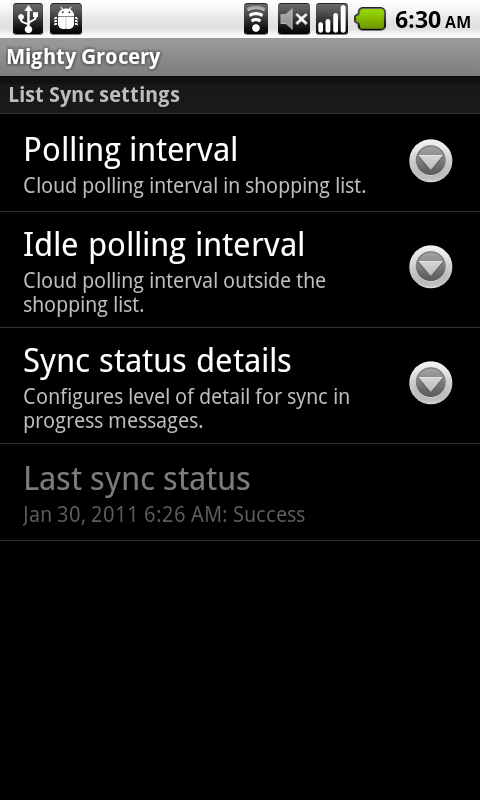 I double-checked that each list that apparently doesn’t make it to the cloud has its Sync List Via check box enabled. I don’t have any local/unsynced lists. The 14 lists that I want to push to the cloud are the only lists I have. Just for fun I added another new list today, I set it to Sync and pushed it, along with the previously existing lists, to the cloud. Just as before, I can’t pull it down on any handset. The app is certainly working for me AS THOUGH only 10 lists can be put in the cloud. What else can I check or try? Thanks so much for your help. That I’m trying to set up an 11th list and more should indicate to the curious that I find Mighty Grocer a VERY useful app. 1. Create a backup. Just in case. 2. Go to Menu –> Settings –> Accounts. Make sure there’s only one account listed. 3. Open your account by tapping its record –> Cloud actions –> Delete lists –> select all lists –> Delete lists. 4. Cloud actions –> Push lists –> select all lists –> Push lists. 5. Check if all lists can be pulled from cloud and are available at https://my.mightygrocery.com. 6. Make sure all your handsets are logged in to this account and there’s only one account record on each device. If this does not help, please let me know your Account ID at hi@mightypocket.com so we could have a closer look. That nailed it. Thanks, Alex! Is it possible to have separate price per unit for each list? For example, if milk costs 3.00 at Food City, but 3.40 at Wal-Mart, will the price and aisle be the same on both lists or will they be different depending which list you are using? Christina, thanks for your question. Yes, unit price and aisle for each list is different. Changes to “Milk” at Food City will not affect “Milk” at Wal-Mart. However, whenever you make changes to your items in shopping list, changes are propagated to Favorites and then to Pick list. So if you’d like to keep unit price different for multiple shopping lists in the future, you will probably need to use List-specific favorites feature. It might be useful to have a look at Linked and Isolated changes as well. I have created a new addition to my ‘Lists’ and have done a “Backup On Cloud” and a “Push List” but after each operation, my new addition to “Lists” do not show up when I log into the web site Might Grocery. What am I doing wrong? HI Bill, thanks for contacting us. Do you mean that a newly created shopping list won’t appear on cloud automatically? That’s true, you need to push a new list so that it would be accessible on cloud. Please let me know if you need any further assistance. I have not only gone into ‘My Account’ and selected ‘Cloud actions’ and then ‘Backup on Cloud’ but I have also selected ‘Push lists’ and the new list still does not show up when I log into the Mighty Grocert web site. Bill, there are a few accounts linked to your email. So it may happen that you actually log in to account other than you push lists to. I’ll be contacting you via email to get this issue resolved. 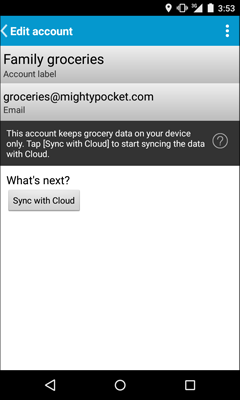 I was planning to reset my phone to factory settings, so I paid for the full version of Mighty Grocery so that I could back up my information to your cloud. When I was doing the backup, it didn’t seem necessary for me to create a password. However, now that I’m trying to restore my information, it’s asking me for a password. How do I get my information back? I figured it out. I went to Accounts, pressed the + button, then “Restore password”. is there a way to type the recipes on the on-line account and then push it to your phone? Or do you really have to use your phone to enter all the recipes? Miranda, thanks for your question. Unfortunately, entering recipes is only available on your phone. We have plans to add this feature going forward. Please let me know if you have any further questions or comments. Hi. I understand the backing up into cloud. Is there a way of backing and restoring on my sd or as html doc so I can copy it to my PC? Thank you. Hi Elaine, thanks for your question. Unfortunately, the only way to backup now is using cloud. We plan on adding other backup options going forward. I really like this app, but we are 5 in my family and we take turns buying the stuff we need. So i was wondering if after i push a list to share with another user, can that user then push it to share it with another user? Or is there any way that more than 2 users can sync with the same lists? Ignacio, thanks for your feedback and your question. Kindly note that it is possible to share shopping lists with 5+ handsets. What you want to do is push a list from your primary phone and pull the list to all other phones. This establishes syncing between the handsets and any changes to the list on any device will be transferred to all other devices. Please see Sync with cloud User’s Guide for more details. This is a great app. We recently upgraded to the full version. 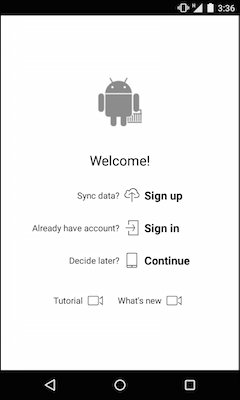 If we have autosync on both our phones, when is a backup needed and what does it do vs just syncing with the cloud and each other on a regular basis? Hi Steve, thanks for your feedback and your question. 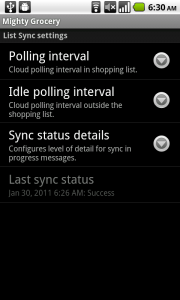 Kindly note that List sync feature will only synchronize shared shopping lists between your phones. 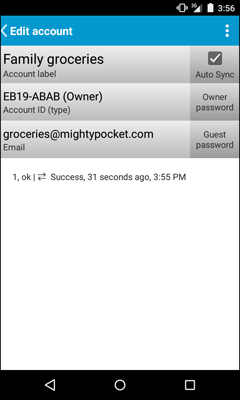 By using backup you can save all your grocery data on cloud such as history, recipes, product catalog, settings, etc. Backup feature comes helpful when anything goes wrong or phone gets lost.